Bracelets are fashion accessories that can take your ordinary outfits a notch up. 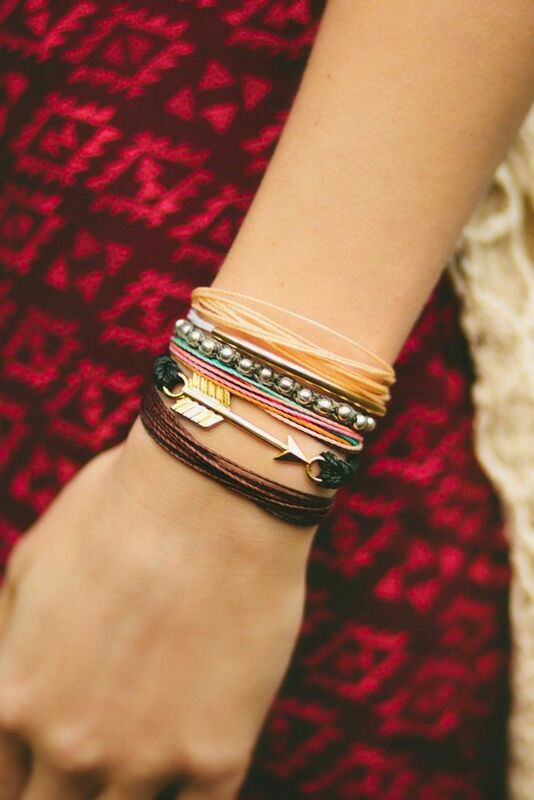 The perfect ‘arm party’ and you are good to conquer the world. Okay that must sound too dramatic but you get the hint. There are bazillion ways how you can style your bracelet. · Color Family- Going monochrome is one way how you can stack bracelets. You can wear different shades of green, blue or whatever color suits your ensemble. For example- If you want to wear blue then you can wear different shades of it. Stack bracelets in colors like Turquoise, Sky blue, Royal and Navy. Same way while pairing your reds- pair colors like Coral, Crimson, Berry and the endless colors in the Red family. · Texture- Stack bracelets of different textures. If you have a wooden bracelet then you can play around textures and stack an ivory bracelet with it. If you own a bead bracelet that is made with bigger beads then you can stack smaller beaded bracelets. Fabric bracelets combined with stone bracelets can make you fashion forward. · Metals- Gone are those days when mixing metals were considered a fashion faux. But now mixing metals is one of the chicest trends. Different metals combined together looks. You can mix rose gold with platinum, silver with gold and metals with metals. While wearing metal bracelets then make sure that you keep a check on the noise factor. Clanging bracelets at work would look inappropriate and distracting. For office, you can wear sleek bracelets or an offbeat metal cuff bracelet. Also, sport a grungy look by wearing a link chain bracelet combined with a leather bracelet. What is better than wearing exclusive jewelry? Do you want to own stuff that all the rest of the women already have? When you buy from the retail stores, you do not get the benefit of exclusivity. This is because these retail stores get their products let’s say jewelry in this case, manufactured. You can either get your own designs of bracelets manufactured at Vogue Crafts or you can shop for their latest collection. This Fashion Bracelets Manufacturer is based in Delhi. There are a variety of bracelets to choose from starting from beaded bracelets, charm bracelets to metal bracelets. Having associations with the giant brands, Vogue Crafts & Designs is emerging as the leading Fashion bracelets manufacturer.